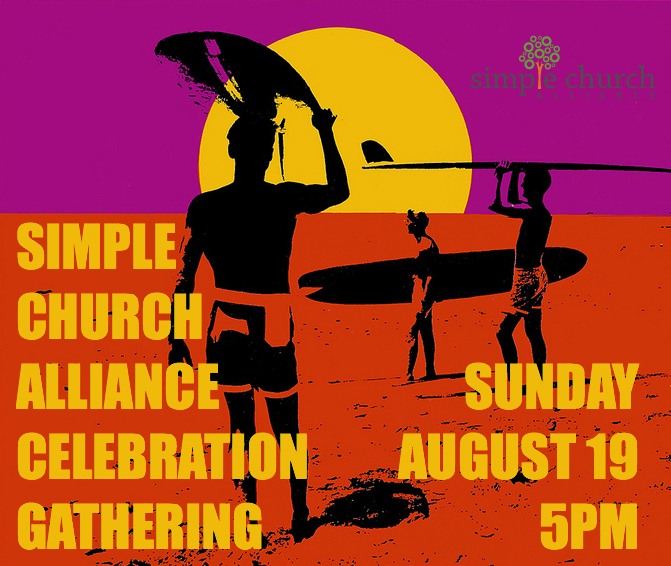 About 5 or 6 times a year the Simple Church Alliance hosts a “Celebration Gathering” of sorts for everyone in the region who weekly gathers together in simple churches. This is a time for fellowship, worship, encouragement, and sharing a meal with others on a similar path. We hope that you can join us as we come together and remind one another that not alone in the journey with Christ outside what many would consider the traditional church route. This month we ask each simple church to consider bringing a song to share/lead during out time together. Please contact me if you would like assistance with sharing the lyrics. We also will have a meal together* and enjoy a shot teaching. Please bring the entire family and a friend if you would like as we finish up the summer and get ready for another school year! *We ask that each simple church bring enough main entre’s, sides, deserts, and drinks for everyone in your simple church and a few guests. If you are not a part of a simple church community at this time, feel free to just show up. If you would like to bring something to share you certainly are welcome to do so but it is not necessary. The simple church alliance will provide ice, cups, napkins, plates and utensils.